Freshman Boy's Wrap Up Great Season! 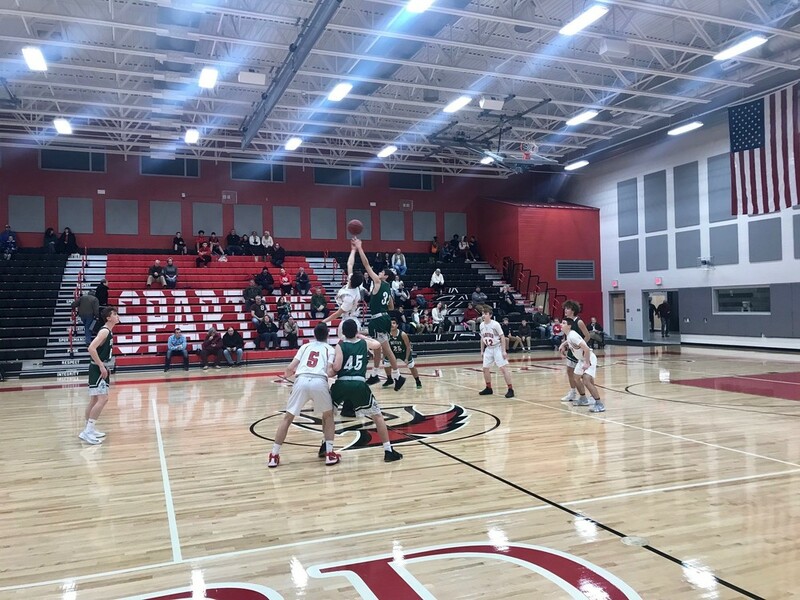 The Sanford Spartans Freshman Boys Basketball team endured great success during the 2018-2019 season. The team finished with a 12-4 record. During the season, the Spartans had a winning streak of five games in a row, while winning seven of the last eight contests. This team demonstrated outstanding work ethic, commitment, discipline, and were very competitive. These student-athletes represented our school and community both on and off the court in a positive manner. The season began with three straight victories, all of which were on the road. The opponents were Scarborough (62-52), Deering (47-41), and Cheverus (57-40). After losing to Thornton Academy at home, the boys got back on track with a Victory against Massabesic (49-37). A loss to Gorham was quickly forgotten two days later when Sanford had a big victory against South Portland (51-42). A tough two point loss on the road versus Portland would be the only time the Spartans would lose in the month of January. From this defeat, would bring about some of the best basketball that was played this season by the boys. Trailing by 8 heading into the fourth quarter, the Spartans outscored Biddeford 17-6 in the fourth quarter for a 53-49 victory. Soon to follow was another victory over Bonny Eagle at home (63-48), outscoring the opponents 23-8 in the fourth quarter. Next was a victory over Windham. On Martin Luther King Day, The Spartans played great situational basketball and had great discipline in defeating Scarborough once again this season by a score of 56-46. The next victim would be Biddeford, winning by a score of 49-39. After a tough six point loss to Kennebunk, Sanford closed out the season with a 55-35 victory against Noble, where every player scored at least a basket in this contest. The last game of the season was a convincing 63-47 victory over Massabesic. The Freshman Team consisted of many players that had key contributions throughout the year. Justin Kennedy led the way in scoring with a couple thirty point games and multiple twenty point performances. Cameron Mathieu was next in line averaging double digits along with Zach McMurtry. Logan Ricker provided a steady offensive presence while also being the teams leader in rebounding and anchoring our defense. Matt Stockwell led the team in three point field goals and averaged close to double digits. Hayden Connarton was one of the most versatile players, smartest, and hardest working on the team. Caleb Cole provided great work ethic and defense. Caleb Lohnes played great defense all year and was one of the most improved players in the program. Ian Nolette had a tendency to hit big three point shots in big games, while being one of the hardest workers in practice and displayed a great understanding and discipline for the game of basketball. Jackson Lyles gave the team great rebounding and brought a great understanding of the game to the table. Tyler Cote was one of the better shooters and hardest workers on the team. This group of student-athletes played with passion, respect, and desire. They represented Sanford Basketball program with class. The 2018-2019 Sanford Boys Freshman Basketball team demonstrated outstanding work ethic, commitment, discipline, and most importantly represented our school and community in a positive way both on and off the court.